Yesterday was a perfect day. Absolutely perfect. The weather was very warm, breezy and sunny. Between meetings and work I really got to explore the city. 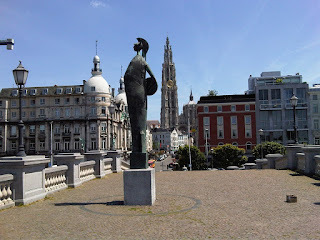 For lunch, George and I walked from our hotel to the main square of Antwerp and the river. We sat for a bit and then ate pizza at this great Italian restaurant by the main church. It was delightful and relaxing and we had a great stroll back. In the late afternoon we decided to have some Belgian beer at one of the gay bars around the corner from the hotel. We started at a place called Body Boys for a (very inexpensive) beer and meeting a couple of new friends. Afterwards we decided to check out more of the neighborhood and went to another bar who's name fails me at the moment. The best was Twilight - a trendy bar with a great back patio. Bryan joined us there for a final beer and we headed back to the hotel. Great time exploring Antwerp!